Valparaiso or Eden Valley as it sounds in a literal translation from the Spanish name of the Chilean city is very beautiful and architecturally rich. Valparaiso is built on dozens of steep hills, which opens incredibly beautiful views of the Pacific. The cultural and historical heritage of Valparaiso can be seen when you walk through the cobbled streets and small alleys that form a kind of labyrinth. It's hard to believe how locals manage to orient themselves among this tangle, because for a foreign tourist it's a whole adventure. 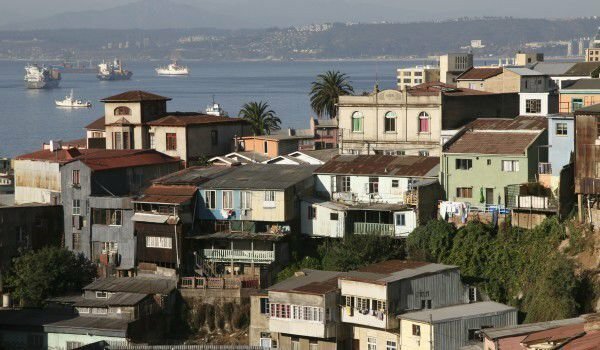 Valparaiso boasts that it has one of the most intriguing urban areas of Latin America. Many beautiful old buildings and monuments are deservedly included in the UNESCO list of world historical and cultural heritage. In 2003 the Chilean Congress declared Valparaíso to the - Cultural Capital of Chile, while taking the seat of the new Ministry of Culture moved to this beautiful city on the Pacific Ocean. Although technically Valparaiso is only the sixth largest city in Chile with a population of around 300, 000, this is the headquarters of the National Congress. The entire metropolis of Valparaiso is 900 000, including the neighboring resort of Vina del Mar, ranks second in population in the country after the capital - Santiago. Valparaiso CE is located in central Chile, 120 km northwest of Santiago and it is the capital of the eponymous province of Valparaiso. For all of the South American country this town is one of the most important ports in the Pacific. Valparaiso has always been an attractive point for European immigrants, resulting in it rapidly growing during the golden years. Then Valparaiso was even called - Little San Francisco or Jewel of the Pacific. In the second half of the 19th century, Valparaiso had quite an important geopolitical role. In those years the city was an important stop for ships traveling between the Atlantic and Pacific Ocean, crossing the Strait of Magellan. Here was the country's first organized volunteer fire brigade. It was also within Valparaiso that the the oldest Spanish-language newspaper became in continuous circulation around the world and also within this city the first Chilean public library began to function. The whole nine universities develop the educational aspect of Valparaiso. The central of Valparaiso is marked by square Sotomayor. One of the sights that you can see here is the monument of Captain Arturo Pratu. Especially beautiful is the view of the cathedral in Valparaiso. Among other attractions, which must be visited within the city are the picturesque fountain in Victoria Square, the Houses of Parliament, the Museum of Natural Science, Museum of art and that of the sea. After the tour of the central zones of Valparaiso you can head toward the port city of Muele Pratt, which is a bustling city market. Be sure to try some local specialties in these coastal restaurants. Each year in Valparaiso in the last three days of the year takes place the very colorful and joyous festival that attracts tourists from around the world. This major event involved hundreds of thousands of Chileans. The climax of the festival is - New Year of the Sea, which is the show of fireworks, considered the largest in Latin America. At this time of year the number of people in Valparaiso is increased by millions because of the arrival of tourists from all over the world.